Drumler is a Laurent Giles Vertue built in 1963 by the Cheoy Lee shipyard in Hong Kong. She was built of Teak, Ironwood and Iroko (a type of Indonesian hardwood), with a long Doghouse and 4 berths. She has sail number 125. Her survey describes her as “a rugged long keel ocean cruiser, Carvel construction, built of Teak on Yacal, Copper fastened, with a long cast iron keel, suitable for world cruising. Rigged as a masthead Bermudan Sloop and fitted with an auxiliary inboard diesel engine, on an inline shaft. With bunks for four”. As far as I am aware, she has had three previous owners. The last owner was David Dow, who sadly died earlier this year. 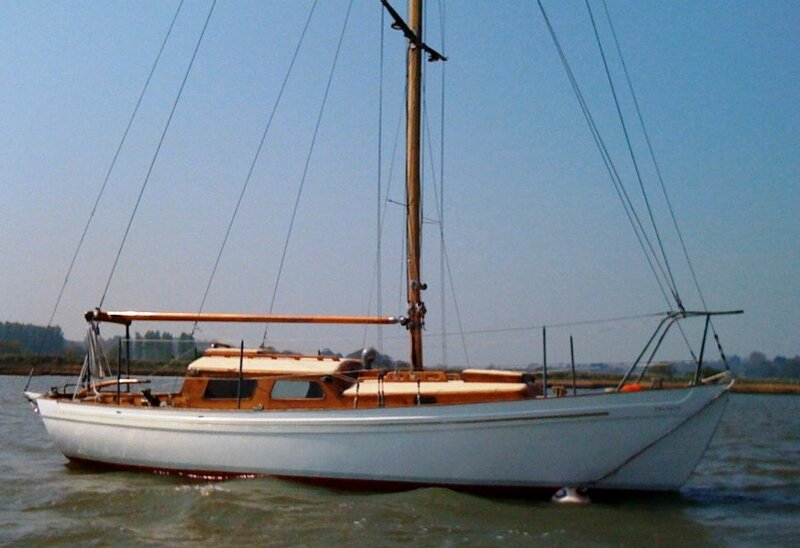 I bought her from David in September 2013, and he had bought her in 1997 from the Daniels family, which had owned her for three generations – grandfather, father and son – for 30 years, based on the Helford River in Cornwall. I will need to do some research on the Lloyds Register to find out the first owner; all I know is that he kept her on the Solent. David regularly cruised to the Ijslemeer, Ostend, Normandy, all the East coast rivers and down to Cornwall, and I also think he once took her to the Faroe Islands.